New engine uses multiple satellite systems at the same time, complements low-power u-blox 7. Swiss-based u blox, a global leader in cellular and positioning modules and integrated circuits, announces the launch of its newest core positioning platform u-blox M8. The new chip forms the basis of u-blox’ upcoming line of positioning modules which are able to acquire and track different satellite systems concurrently to achieve higher accuracy and reliability. Supporting all deployed as well as upcoming Global Navigation Satellite Systems (GNSS), the platform is based on the UBX-M8030 concurrent multi-GNSS receiver IC which is able to track American GPS, European Galileo, Japanese QZSS, Russian GLONASS, and Chinese BeiDou satellites. Concurrent tracking of GPS (QZSS) and GLONASS or BeiDou, or concurrent tracking of GLONASS and BeiDou satellites increases performance for applications requiring maximum availability and accuracy. The chip is prepared for the European Galileo system through a future firmware upgrade once the constellation is fully available. The new platform will ultimately support special functions such as Automotive Dead Reckoning and precision timing to support a wide variety of vehicle, industrial and consumer applications. To further improve acquisition performance, u-blox’ globally available “AssistNow” assisted-GNSS service for accelerated positioning has been extended for u-blox M8 products; the service supports both GPS and GLONASS, and the validity of downloaded assistance data is now able to support offline operation for up to 35 days. The new u-blox M8 chip is at the heart of u-blox’ next generation of positioning modules based on the company’s popular MAX, NEO and LEA module form factors. 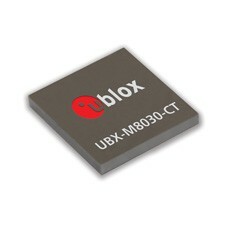 u-blox M8 chips feature low power consumption in concurrent reception mode, thanks to an innovative single-die architecture combined with sophisticated software algorithms. The extended supply voltage supply range and 1.8 V/3.0 V I/O compliance supports a wide variety of system architectures. Sophisticated radio architecture and interference suppression using active jamming detection ensure maximum performance even in GNSS hostile environments. UBX-M8030 chips are available in miniature WL-CSP (2.99 x 3.21 x 0.36 mm) and QFN (5.00 x 5.00 x 0.59 mm) packages. The chip is also available in automotive quality grade according to AEC-Q100. The new platform maintains backwards compatibility with u-blox 7 modules and QFP chip products which remain in the company’s portfolio as the industry’s lowest power standalone satellite positioning receivers. u blox’ capability of delivering GNSS technology in both integrated circuit and form-factor consistent modules provides maximum design flexibility and protects customers’ development investments over successive product generations. First samples of the multi-GNSS receiver chip UBX-G8030 are available for customer evaluation. Soon, module customers can easily migrate to the MAX, NEO, and LEA form factors, u-blox’ popular, industry-standard module form factors.